Altug Öztürk takes over the position as president from Brit Flemmen Berg, leading the new board of ESN Molde. Rector Hallgeir Gammelsæter (left) honoring the outgoing president Brit Flemmen Berg (right). Erasmus Student Network’s (ESN) Annual General Meeting was meant to be an ordinary assembly, looking back at what happened so far this year and elect a new board. But as things never turn out the way you expect, the Wednesday meeting was suddenly interrupted by a loud «Tatarataaaa!» from HiMolde’s rector Hallgeir Gammelsæter and International Coordinator Anette Kristin Myrstad to give the outgoing president Brit Flemmen Berg a warm departure. Here you can watch how the meeting was crashed. «Brit has been doing a great job. She has been involved so much in international students, organizing and welcoming them on the Campus. And for the next president, you see what you have to live up to», Hallgeir Gammelsæter honored Brit’s commitments and dedication within the last months. Despite of stepping down, Brit will stay a member of ESN Molde’s board as she got elected as the new treasurer. 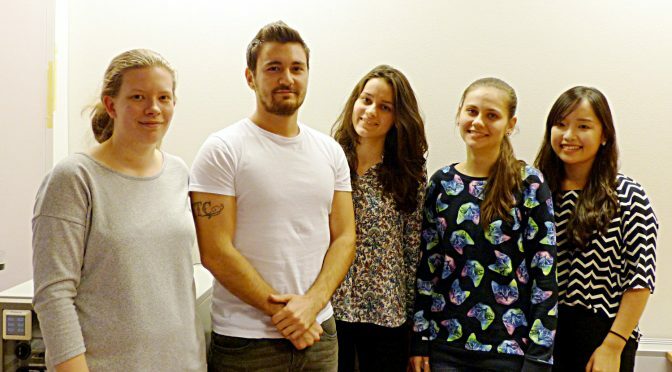 But the main responsibility is now up to ESN Molde’s new president Altug Öztürk to continue along this successful path. Altug, who is originally from Turkey and just started his MSc program for Sports Management at HiMolde, convinced the elective members of ESN Molde with his ambitious speech. He also called for more Norwegian students to join and engage in ESN. Besides Brit as treasurer, Altug will be supported by the likewise newly-elected Vice President and Local Representative Sienna Li, Katerina Moskaleva as Webmaster and Tatsiana Pekarskaya as PR-Manager.